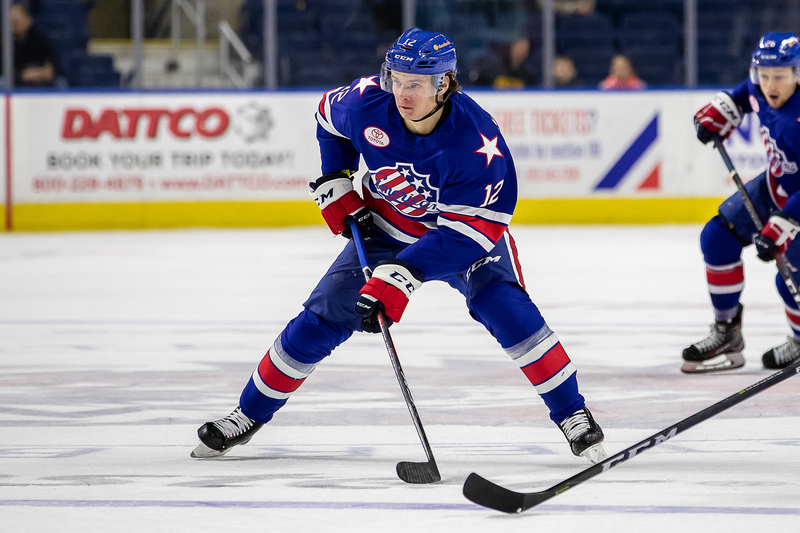 Olofsson Leads Amerks to Two Comeback Wins · Let's Go Amerks! The Amerks took care of some firsts of the season over the weekend and were rewarded with four points in the standings. Down by two goals on Saturday they came back to win 4-3 with goals from CJ Smith, Alex Nylander and the game winner from Victor Olofsson. Sunday afternoon they were down 2-1 going into the third period and Zach Redmond scored early in the third and Victor Olofsson scored the game winning goal in overtime. They’re now on a three game winning streak after opening the season with two miserable home ice losses. For immediate updates on all games make sure to follow @LetsGoAmerks on Twitter! (Bridgeport, CT) … Facing a 3-1 deficit midway through the second period of the first game of the weekend-series with the Bridgeport Sound Tigers (1-2-0-0), the Rochester Americans (2-2-0-0) answered with three straight unanswered goals, including one in the final minute from rookie forward Victor Olofsson, to earn a 4-3 come-from-behind win at Webster Bank Arena Saturday afternoon. For the second consecutive contest, Olofsson (1+1) and veteran defenseman Zach Redmond (0+2) each booked multi-point performances to help the Amerks to their second straight win. Kevin Porter and Alexander Nylander each scored their first goals of the campaign while second-year forward C.J. Smith added his team-leading third tally in Rochester’s first four games. Scott Wedgewood stopped 20 of 23 to record his first official win between the pipes while wearing the red, white and blue. Travis St. Denis and Connor Jones each netted the first markers of the season for the Sound Tigers while Steve Bernier added his second of the slate in the defeat. Goaltender Christopher Gibson made 24 saves but was handed his second straight loss. Moments after the Amerks’ sixth man-advantage of the game had expired, Brendan Guhle fired a shot from just inside the Sound Tigers blueline. It appeared that Gibson was likely going to force a whistle, but Smith was able to dig the puck out before the goaltender could glove it and slipped it over the goal-line to trim the Bridgeport lead to 3-2 with 4:30 left. Guhle and Justin Bailey each were credited with helpers on Smith’s team-leading third goal of the year. Before the final period of regulation reached the 5:00 mark, the Amerks drew a pair of cross-checking infractions and had a 5-on-3 for 1:22. Rochester controlled the puck for much of the first-half of the penalty before Nylander rocketed a cross-ice feed from Olofsson to knot the score at 3-3 with 14:26 left in regulation. It was the Amerks’ second power-play goal of the game and fifth in the last two contests. Redmond and Olofsson each picked up their American Hockey League-leading fourth power-play assist on Nylander’s first tally of the season. As for Nylander, the third-year pro shows four points (1+3) over his last three games and is fourth among the team’s skaters with eight shots. Before the Amerks finished the come-from-behind win they were forced to kill off their own 5-on-3 disadvantage for an entire two minutes inside the final 4:14 of regulation. Much like the Rochester shorthanded unit had done in the three previous infractions on the afternoon, the Amerks successfully killed off the penalty and seized the momentum. As an overtime period was looming, Danny O’Regan forced a turnover in the neutral zone that Olofsson flagged down near the offensive zone. Protecting the puck as he entered Bridgeport zone, the Swedish forward sent a backhanded-shot over the left shoulder of the unsuspecting Gibson to give Rochester its first lead of the afternoon with one minute left in the game. The goal was Olofsson’s fifth point (2+3) in his last two outings, giving him a share of the league’s scoring lead among all AHL first-year skaters. Despite Bridgeport pulling the goaltender for the final 60 seconds of the matchup, the Amerks held off the attack to earn the 4-3 come-from-behind victory, their second straight comeback win in the last two contests. With the today’s win, the Amerks have improved to 3-1-1-0 in their last five meetings against the Sound Tigers after going just 1-3-0-0 in the four meetings during the 2016-17 season. Bridgeport took a 2-1 lead and a 12-8 shot advantage into the first intermission before Rochester outscored the Sound Tigers 3-1 over the final 40 minutes of play. The Amerks registered 20 shots over that same span. The Amerks and Sound Tigers get right back at it for the second of back-to-back meetings at Webster Bank Arena Sunday afternoon at 3:00 p.m. The contest can be heard live on The Sports Leader 95.7 FM/950 AM ESPN Rochester and viewed on AHLTV. (Bridgeport, CT) …After setting up the game-tying goal in the third period to force overtime during Sunday afternoon’s game between the Rochester Americans (3-2-0-0) and Bridgeport Sound Tigers (1-2-1-0), rookie forward Victor Olofsson delivered the game-winning goal just 1:46 into the extra stanza to give Rochester a 3-2 victory at the Webster Bank Arena. With today’s overtime-victory, the Amerks have improved to 4-1-1-0 in their last six meetings against the Sound Tigers. Additionally, Rochester has won back-to-back games in Bridgeport for the first time in franchise history. For the third consecutive contest, Olofsson (1+1) tallied a multi-point game to help lead Rochester to its third straight win while second-year defenseman Brendan Guhle added a pair of assists for his first two-point outing of the season. Zach Redmond recorded his second goal of the slate while Eric Cornel also bagged his second of the campaign. Goaltender Adam Wilcox, who made his second start in the last three contests, finished the game with 15 saves to earn his second win of the season. Dating back to the end of the 2017-18 season, Wilcox shows a record of 4-0-1 in his last five appearances. Travis St. Denis and Mike Sislo each lit the lamp for Bridgeport while netminder Jeremy Smith stopped 29 shots but was given his first overtime loss of the season. The Sound Tigers tallied a pair of second-period goals and took a 2-1 lead into the final period. However, a late penalty gave the Amerks a full two minutes of power-play time to begin the final 20 minutes of regulation. Rochester only needed 48 seconds to even the game as Redmond gave the club its league-leading seventh power-play goal of the season from Olofsson and Lawrence Pilut. The marker was Redmond’s seventh point of the season, which paces all AHL defensemen, and Olofsson’s fifth assist while on the man-advantage that leads all AHL skaters. Continuing with the momentum, the Amerks outshot the Sound Tigers 11-2 during the final period but an extra-period was required as the two teams were tied at 2-2. The two teams traded a shot early in overtime, but Guhle collected the puck out in front of Wilcox and gave it to Olofsson near the center-ice dot. The Swedish forward entered the offensive zone 1-on-3 but he quickly fired a shot that glanced off the inside of left post and past Smith to complete the two-game weekend sweep. Cornel gave the Amerks a 1-0 lead after the first period as he redirected his second goal of the season past Smith at the 15:11 mark from Guhle and Alexander Nylander. With his assist, Nylander has five assists over his last four games while Guhle earned a helper for the second straight night after being held without a point in the first three contests of the year. Bridgeport was able to score a pair of goals in the second before Redmond knotted the score in the first minute of the third that ultimately forced overtime. The Amerks close out their three-game road swing on Wednesday, Oct. 17 when they face the North Division rival Utica Comets at the Adirondack Bank Center. The 7:00 p.m. contest will be the first of 10 scheduled meetings between the two team this season and can be carried live on The Sports Leader 95.7 FM/950 AM ESPN Rochester as well as AHLTV.